Recently, DHS’s Domestic Nuclear Detection Office (DNDO) awarded a multimillion dollar contract which will equip U.S. Coast Guard (USCG), U.S. Customs and Border Protection (CBP), and Transportation Security Administration (TSA) frontline personnel with a new capability to detect and interdict radiological or nuclear threats. The award is for small, wearable radiation detector devices – called Human Portable Tripwire (HPT) — which passively monitor the environment and alert the user when nuclear or other radioactive material is present. Recently, DHS’s Domestic Nuclear Detection Office (DNDO) awarded a multimillion dollar contract which will equip U.S. Coast Guard (USCG), U.S. Customs and Border Protection (CBP), and Transportation Security Administration (TSA) frontline personnel with a new capability to detect and interdict radiological or nuclear threats. DNDO says that the award is for small, wearable radiation detector devices that passively monitor the environment and alert the user when nuclear or other radioactive material is present. Known as the Human Portable Tripwire (HPT), this device has the capability to identify the source of radiation and allow personnel to take appropriate action. The technology can also locate the source of the detected radiation and includes communication features that allow the user easily to seek additional technical assistance from experts if needed. 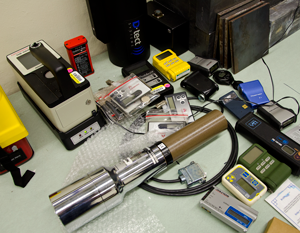 These devices are a critical tool for personnel who operate in the maritime environment, at land and sea ports of entry, and within the United States. DNDO says that the Human Portable Tripwire award represents a successful collaboration between CBP, USCG, TSA, and DNDO to award one contract that meets the needs of multiple DHS components. “This is also an example of the accomplishments we can achieve under the Unity of Effort initiative,” DNDO notes. DNDO worked closely with CBP, USCG, and TSA from the proposal evaluation stage, through the testing and evaluation, to deployment planning. “Such collaborative efforts strengthen our homeland security and increase the Department’s ability to thwart potential radiological or nuclear threats,” DNDO said.